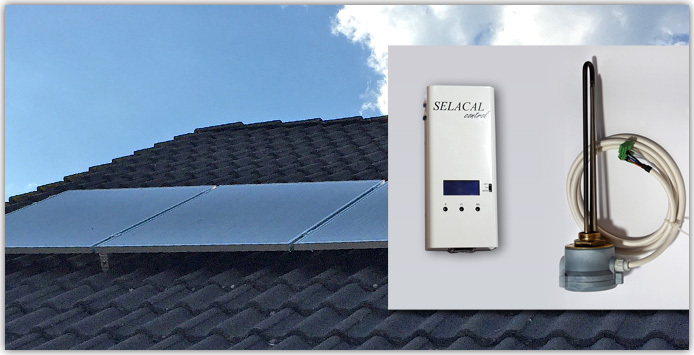 The PV solar modules (1) deliver the solar power via SELACAL control (2) for the PV-heater (3). The PV-heater SELACAL can be used in different kinds of hot water tanks (4), like buffer- or DHW tanks. It can easily be screwed in a socket of 1-1/4 " in the tank and also the temperature sensor (5) is implemented. 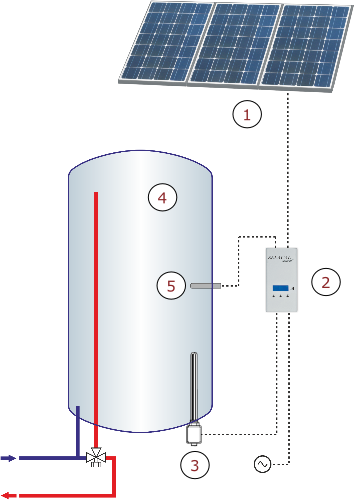 So existing hot water can easily be solar heated or new storages can be used multivalent. That simplifies the solar facility planning and installation times can be cut in half. With the PV-heater 1000 DC now you can use solar electric hot water anywhere.